The location of settlements near the Keiryaki, Gushchu, Hokmali, Bozdag Gobu mud volcanoes is particularly dangerous, Elkhan Mammadbayov, assistant professor of the Geography Institute of the Azerbaijan National Academy of Sciences (ANAS) said on December 15. He stated that the morphometric parameters of the Dashgil, Shakhgay, Chapylmysh, Cheyildag, Toragai, Akhtarma, Pashaly, Demirchi and other intensive mud volcanoes were studied in various landscapes of the territory. It was found that they affect the landscapes of the nearby territories. “The impact of mud volcanoes on the life and economic activity of people and on infrastructure was studied. Locations near the Keiryaki, Gushchu, Hokmali and Bozdag Gobu mud volcanoes are particularly dangerous. Despite the fact that experts warn the relevant structures about this, residential buildings continue to be built near volcanoes,” Mammadbayov said. There are 1400-1500 mud volcanoes on Earth. It is known that Azerbaijan ranks first in the world in the number of mud volcanoes. There are about 350 of 800 of all known mud volcanoes in our country. In the people they are also called as “Yanardag” (burning mountain), “Pilpilya” (terrace), “Gainacha” (boiling water), “Bozdag” (Gray Mountain). Mud volcanoes appeared on the territory of the present Azerbaijan Republic 25 million years ago. An interesting natural phenomenon - mud volcanoes by origin are associated with oil and gas fields. They are always in the center of scientists’ attention. Rich deposits of gas condensate and oil were discovered at the sites of mud volcanoes (Lokbatan, Garadagh, Oil Rocks, Mishovdag, etc.). Mud volcanoes are located far from populated areas. Most of these territories are under protection, and it is strictly forbidden for people to enter there without special permission. Otherwise, everyone will face a large fine - for individuals the amount is 400-600 manats, and for officials – 2,000-4,000 manats. These bans have several reasons. Firstly, in this way the territory of the volcanoes is protected from possible contamination by people, secondly, possible attempts to carry away the mud from the territory of the reserve are prevented (this mud can be used during construction). And finally, the main reason is that each eruption volcano is a danger to human life. Volcanic eruptions have occurred on the territory of Azerbaijan many times. The first eruption of the volcano occurred in 1828. It was located 15 km from the capital Lokbatan volcano, and it has erupted 17 times since then. As many as 418 eruptions have been recorded in 93 mud volcanoes in Azerbaijan over the past 200 years. The eruption of mud volcanoes is accompanied by strong explosions and underground roar. Gases come out of deep layers of the earth and immediately ignite. The height of the flame above the volcano reaches 1000 meters (Garasu volcano). The volcano Tuorogay from 1841 to 1950 erupted 6 times. In recent years, our mud volcanoes have attracted attention abroad. NASA geologists who have studied the nature of Mars give interest facts. They concluded that mud volcanoes of Azerbaijan are similar to uplands of the planet for their structure. Mud volcanoes of Azerbaijan took the 5th place at the international competition of the Swiss non-profit organization “Seven Wonders of Nature”. And on September 15, 2004, the largest mud volcano in the world, located on the territory of Azerbaijan, entered the The Guinness World Records. In order to strengthen the protection of mud volcanoes in 2007, the Azerbaijan’s President, Ilham Aliyev, ordered the creation of a natural reserve on the Absheron Peninsula. It includes mud volcanoes located on the coast of the Caspian Sea, as well as near the main roads and settlements. Volcanic mud is an excellent remedy for many diseases. Volcanic clay is an excellent raw material for the manufacture of expanded clay, bricks, metallurgical pellets, etc., therefore it is widely used in construction. Volcanic breccia (a product of a volcanic eruption) contains a number of valuable chemical elements, metals, which can also be extracted and used for the needs of the national economy. Due to its balneological properties, volcanic mud is used by physicians in the treatment of many diseases (skin, gynecological), as well as in cosmetology. To protect the natural monuments of volcanoes, a number of activities are provided for; a Coordination Council has been established, which included 15 scientists. At the approaches to the volcanoes, security inscriptions have been installed, informing that these monuments of nature are protected by the state. In 2008, the Guidebook on Mud Volcanoes of Azerbaijan was published in Azerbaijani, English and Russian. Here, volcanoes are represented in all their greatness and diversity in their morphology and form of manifestation (active, extinct, oil-releasing, insular). Many beautiful, impressive volcanoes with bizarre tongues outpouring mud, large coastal volcanoes, as well as activities differing in their nature in the form of continuous eruption (mud squeezing), which we observed with great interest, are among them. 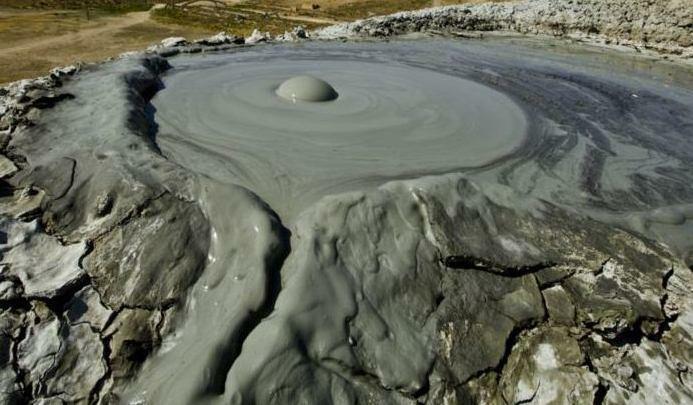 Mud volcanoes, of course, are of interest to tourists and lovers of nature in general. A trip to the mud volcanoes makes it possible to evaluate their uniqueness and uniqueness, plunge into the wonderful world of these natural monuments and closely get acquainted with the biodiversity of the natural environment, as well as the history and culture of ancient Azerbaijan.